Today is Fit Transformation Project Day 4. Things have been going great with my workouts. I am still not as strict on my eating as I need to be, and I am beating myself up a little on that. I didn't start logging my food in myfitnesspal.com yet. I need to start that immediately. I have had one PT session, one on my own run, and one boot camp so far. Today I have a PT session and I think we are going to try to video some of it for my VLOG today. Yay! That should be fun. I will post here when I am done. Last but not least! THE SOX BOX review!!! You all know that I am in LOVE with my socks! 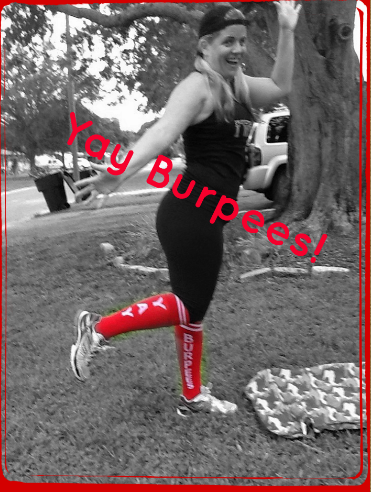 First of all, I love to hate burpees, so they are perfect for me. When I first contacted The Sox Box, it was because I wanted the Strong Mama socks. The owner, Athena sent me these 3 pairs and told me to review one... I had to keep the burpees!!! Are you kidding me! I love them!! You may or may not know that Cross Fit (at least I think it is Cross Fit) has brought a craze into the workout world with knee high socks for women. The Sox Box at www.TheSoxBox.com has some of the cutest socks I have seen. I will tell you that they are comfortable and super cute. They wash up well too. They are a must have. Check out their facebook page too. https://www.facebook.com/TheSoxBox?ref=ts The best part about this company is what I read on their site: ~We honor those service men and women who sacrifice their lives in the name of freedom and justice. Their pledge of onor for their fellow service members and country is unparalleled and for that we must both rock and salute them! Our pledge is the lifetime donation of 20% of all the Sox Box profits to go to the Independence Fund, a non-profit group that directly supports the wounded, ill and injured service members. Pretty awesome if you ask me!!! those socks are so cute! 120 pushups are crazy! Great job! I love the look of these socks and really need some new ones. Throw on some bright yellow or orange running shoes and you're set to wake up those sleepy-heads on morning runs! Hmmm... have you noticed how almost everyone in olympic track is in yellow!?! Look at you killing it. I am not very good about doing any strength training and am trying to add it in. I use myfitnesspal and it helps me a lot. I still need the accountability of it.